Sign up for Broadjam today to follow Shawn Lidster, and be notified when they upload new stuff or update their news! Shawn Lidster is a singer/songwriter from Brigus, NL who has been writing and performing a wide range of original material for more than 20 years. In 2003 Shawn did a remix of his song, Sealer Song for the Homebrew 4 CD and in 2004 his song Newfoundland Summer’s Day (recorded in Great Big Sea’s studio) was released on Homebrew 5 CD both songs get extensive play on traditional radio station’s here in Newfoundland. Shawn’s new project called Legends on the Baccalieu Trail has been years in the making. He has done extensive research into the history of Cupids,Brigus,Bull Cove,Harbour Grace and Carbonear. The time line of songs that Shawn has written shows how he has developed as a songwriter. The songs get right to the heart and soul of the characters he is reflecting on and brings the listener back to the era in which he is singing about. In July 1994, Shawn formed Lidster’s Hill with his sister Juanita, cousin Audrey and friend Jim Wheeler. Lidster’s Hill entered the Big Break Blast-Off competition that was held in St. John’s and stole the show. They took top spot from more than 20 acts by performing six original songs written by Shawn. The prize was 100 hours of studio time that led to the release of “Swally Dis” a cassette containing an eclectic mix of all original songs. Although the band did not stay together long, they did get to open for Canadian Country Music Artist Charlie Major when he was in St. John’s and had two traditional songs off Swally Dis, The Sealers Song and Newfoundland Summers Day received extensive air play in Newfoundland and Toronto. Shawn shopped the tape around to various music industry people at the 1995 Canadian Music Week Conference held in Toronto and then he went to Music West in Vancouver. He checked out a showcase that had the Australian band the Pale Riders on the bill, they quickly became friends exchanged CDs and tapes and vowed to keep in touch. Then in 1997, the Pale Riders invited Shawn to be their opening act for the launch of their new CD and tour of Eastern Australia and Tasmania. Shawn jumped at the opportunity, sold just about everything he owned packed up his guitar and made the move to the land down under. While in Australia Shawn, crafted his song writing skills. He entered a theme song competition for Sydney’s rock station Triple M and won $15,000 worth of Sammy Hagar’s (Van Halen) gear when his song the Ratso Man was chosen as the winner. Shawn also had the opportunity to play along with Randall Waller who is now Shania Twain’s guitar player. Randall liked the Sealers Song so much he used to get up on stage and jam along with Shawn. Shawn also matured as a performer his songs about Newfoundland went over really well in Australia and still today continues to write songs about home. He calls it Newfoundland Roots Music. 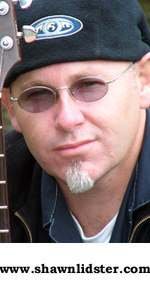 In 1999 while still in Australia, Shawn formed an acoustic duo with Scott Mainwaring (ex Pale Riders) called Silver Dollar, Silver Dollar played a wide mixture of songs for all ages and was a huge success in Sydney and on the Central Coast. Silver Dollar’s first gig was opening act for Mark Evans (original bass player for AC/DC). In 2002, Silver Dollar ended and Shawn packed up and took his family back to Newfoundland.